Jean-François Millet, by name Francisque, (baptized April 27, 1642, [Belgium]—buried June 3, 1679, Paris, Fr. 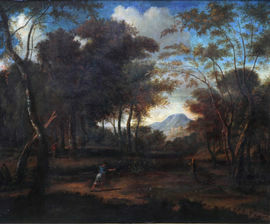 ), French painter whose serene landscapes made him one of the most influential followers of Nicolas Poussin in 17th-century France. Millet is generally classed among the painters of Flanders because of the location of his birth, but his father was a Frenchman who, while on service with the prince of Condé in Antwerp, apprenticed his son to a painter there. Francisque left with the painter for Paris, where he settled in 1660 after marrying his master’s daughter. He was received as a member of the Royal Academy of Painting and Sculpture at Paris in 1673. Francisque’s paintings of Italian and Arcadian scenery, though derivative, were graceful and effective. Twelve of his most important landscapes in the Tuileries were destroyed by fire; and, though many of his pieces may still be found cataloged, a great number remain unknown and unacknowledged.